When you take in the view east of our hotel, just past I-75, you'll see rustic fields and warm countryside; to the west, the burgeoning city of Lima, Ohio. 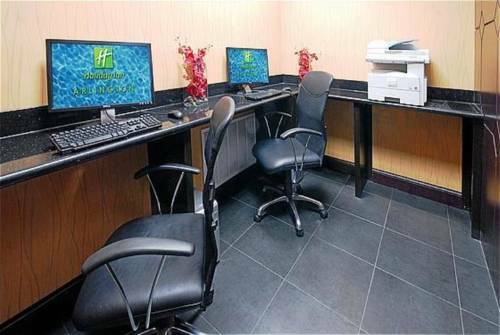 Here at Holiday Inn and Suites Lima, we take pride in maintaining that balance between 'Downtown' and 'Down-home'. Welcome to the Holiday Inn and Suites, Lima, Ohio's newest full service hotel. Our property proudly boasts of The Lounge, our restaurant and full bar, which provides room service to all 116 beautifully appointed, newly renovated rooms and suites. After dinner, relax in our indoor heated pool and hot tub or burn off those calories in a fully equipped workout room. With 2400 square feet of versatile meeting space we're here to help you celebrate wedding vows or reminisce over drinks with former classmates during a reunion. Within minutes of industry centerpieces such as Ford Engine Plant, Procter & Gamble, the Husky Refinery, Lima Memorial Hospital, Mercy Health St. Ritas Medical Center, Dana Incorporated, and the Orthopaedic Institute of Ohio, your business trip will be streamlined and efficient. If youre in town seeking that deal-sealing handshake from a potential client or partner, the local dining scene is the way to impress. Whether its steaks at Old City Prime, a gourmet burger and designer cocktail at The Met, hibachi and a Spicy Girl sushi roll at Yamato, or a bottle of wine at Vino Bellissimo (where they also have 36 craft beers on tap! ), the only way you wont impress is if you dont try. The Lounge: After a long day in Lima, Ohio, our hotel's lounge offers a great way to relax and unwind. Sip your favorite cocktail or beer while socializing with friends or entertaining business clients. A menu of light appetizers is available to go with your drinks. Grand Ballroom: 2100 square ft of beautiful space complete with built in bar space. Limaland SpeedwayLimaland Motorsports Park is a a fast action packed family show on Friday evenings and special events. Limland has become the #1 NASCAR Licensed Home Track in their first year as a NASCAR Sanction Track.